88 Fortunes by Bally is a 5 reel and 243 ways to win slot. It comes with a progressive jackpot and a Chinese luck theme. Features here include; a Fu-Bat Jackpot feature, free spins, symbol swaps, etc. The jackpot feature involves you trying to match 3 Baby symbols and hoping to win 1 of 4 progressive jackpots. The Free Games feature starts with 10 free spins and can be reactivated for additional free spins. 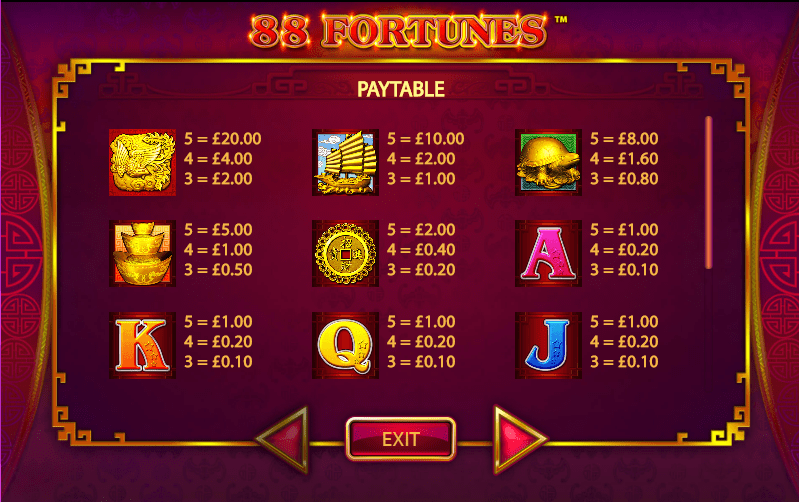 The slot can be played on your desktop, mobile and/or tablet devices for stakes starting from 88p to £88 per spin all here at https://www.megareel.com. Bally Technologies is one of the most famous and top slot gaming machine manufacturers. The company also develops other gaming-based technology. Its main office is situated in Las Vegas, Nevada. The company was established in 1968 and was registered as Advanced Patent Technology. They had a name change to Alliance Gaming in 1996 when the company was later bought by Bally Gaming International. Finally, in 2006 the company changed their title to Bally, which became its trademark. This slot has a lucky Chinese theme. For example, red is believed to be the lucky colour. The slot has a predominantly red colour. Game symbols include; golden turtles, golden ships, golden eagles and golden gongs. The golden eagle pays the highest value. If 5 land on a payline, you win 1,000 coins. Free Games feature -This feature is activated when you land 3 or more scatters (the scatter is the Gong symbol). The feature rewards you with 10 free spins. During the feature, the 9, 10, J, Q, K and A symbols are swapped with 5 major value symbols thus increasing your chances of winning big. You can also win extra free spins and what's even better is that there is no cap on how many free spins you can win. Meaning that you can trigger the round as many times as you like. In addition, the Fu-Bat feature can also be activated again giving you extra chances to land a progressive jackpot. To try some of our other games, browse our selection when you click here. 88 Fortunes operates largely on luck. It uses the All Up game engine, which gives players the opportunity to purchase gold symbols to raise your winning potential. 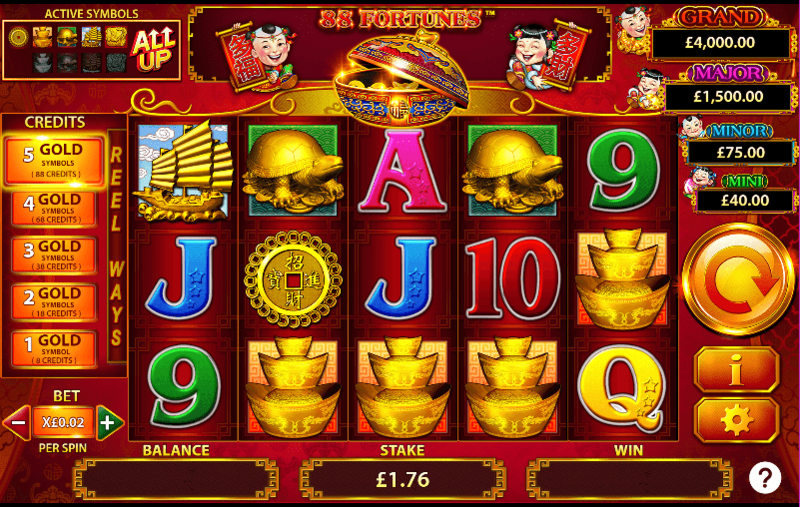 It’s a very popular land-based slot, with a popular online version which is expected to be still as popular as the land-based version. It's a medium variance game with the free spins feature being the most profitable route. The progressive jackpots are much more difficult to hit, but one can only hope that they do. If you like 88 Fortunes, you should try your hand at 7s to burn.